how aware people are that these services are, in fact, provided by nonprofits. 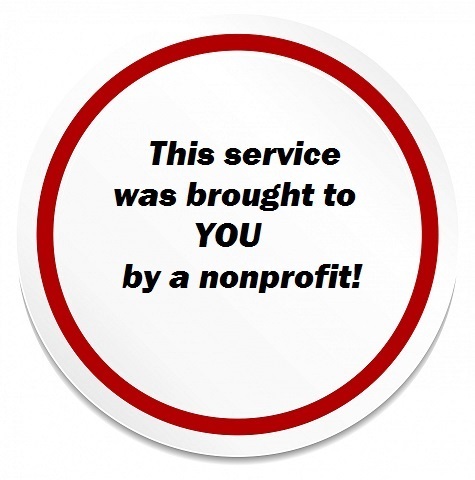 As someone who has worked in the nonprofit sector since my first job at age 16, it just never occurred to me that end-users wouldn’t know that an organization they attended or visited or whose services they used was provided by a nonprofit. Now there’s a public education opportunity. Somebody call the marketing department! I guessed that, when they broke down the responses by income category, there would be higher use of charity services by lower income folks. 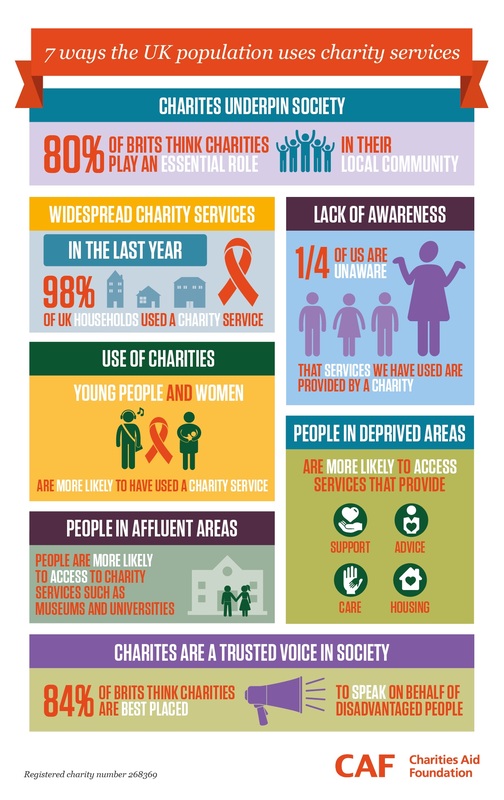 People in affluent areas are actually more likely to use charity services. Which is a very interesting fact for fundraisers, no? The types of services used by income category vary by type. Those in higher wealth bands use these four services most: museums, universities, churches, and voluntary groups. Those in more deprived areas use these four most: charitable housing association, support care, counseling, and advice from a charity’s website. But both groups are nearly even when it comes to visiting a charity-run thrift shop, adopting a pet, using medical services, seeing a play, or utilizing a community center. Across all demographics, young people and women are the larger users of services provided by all charities. Across the board, the number one benefit that respondents said was provided by charities was an enjoyable experience that enriched their life. 92 percent believe that charities play an essential or very important role in society in general, and nearly all (98%) had utilized the services of a charity in the last year. The need for, and use of, nonprofit organizations permeates all of our daily lives, whether we realize it or not. Maybe we need to make up stickers or something. 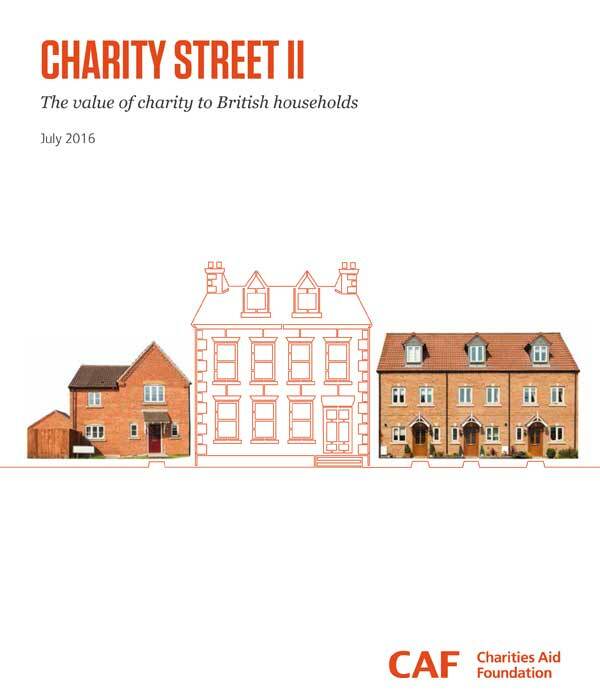 At any rate, this report provides lots more information than I have covered here, in a well-organized 19 pages, and if you’re interested in how people view and use charities, it’s well worth a look. CAF images used with permission, (c) 2016 Charities Aid Foundation.